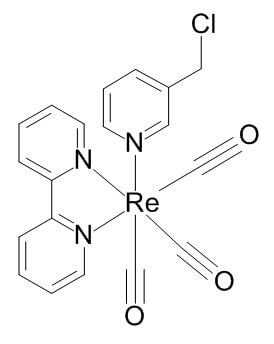 Relevance 3-Chloromethylpyridyl bipyridine fac-tricarbonyl rhenium is a mitochondrion-selective metal-to-ligand charge transfer rhenium dye, that has been designed for a specific biological target. It has the advantage of a long lifetime and a large Stokes shift, which makes it an attractive candidates for biological imaging. Notes 3-Chloromethylpyridyl bipyridine fac-tricarbonyl rhenium showed the typical photophysical properties of a cationic rhenium tricarbonyl bisimine; excitation at λmax 364 nm, emission at λmax 551 nm and a fluorescence lifetime of t = 131 ns.